Finding common ground: Could music festivals help us solve collective action problems? This article was first published on The Verb. Read the original here. It was dark when I arrived at Commonground. Fresh from the buzzing glow of a computer screen, I could feel the weight of emails lifting off my shoulders the further I escaped from the city’s clutches. The frenetic pace of urban life meant I barely had time to throw my tent in the car before shutting down. And there I found myself, alone under the stars with no hammer, no light and no way to set up my sleeping quarters for the next three days. “No worries, we’ll give you a hand,” a couple shouted out. I couldn’t see their faces but that didn’t matter. Their friendly offer of help was to be the first of many I would experience as part of the Commonground Festival community that weekend. What I found was a caring community, committed to change. Whether it be workshops on emotional resilience, happy yoga, fresh produce, or music, every experience was carefully crafted to challenge and to celebrate. “We wanted to create an intention around celebrating social change,” said Carl Scrase, one of the festival organizers. “Celebrations have satisfied innate human needs for a long time. We don’t actively celebrate in our current culture; we don’t have the same rituals that bring communities together,” he said. What role for music in social change? The sense of trust, friendliness and warmth extended to all parts of the festival, including the musicians and performers, said Bruce Shepherdley, bass player with The General Assembly whose songs weave vivid tales of a civilisation disconnected from itself. Music has long been accepted as a tool for social change, however the ballsy and intuitive music festival melodies of decades past have often been replaced by lyrical laziness. Reintroducing social passion into music was one of the main focuses of this year’s Commonground festival. “When you’re writing songs of celebration, if you can sing those things everyday, you are one step closer to that change,” said Deline Briscoe, an indigenous singer-songwriter who brought the house down when improvising the last 15-minutes of her set. Considering that the festival is staffed entirely by volunteers, the importance of community empowerment cannot be understated. “[We aimed to] teach volunteers how to collaborate in efficient ways while looking after each other,” said Scrase who is also a facilitator and organisational collaboration consultant. The festival has provided lots of benefits to the wider community, Scrase said, citing the various life skills workshops run during the weekend by the GroupWork Institute addressing important personal and professional skills such as being emotionally resilient, how to cope with challenging encounters, collaborating effectively in groups. A concurrent unconference program allowed anyone to attending the festival to run their own session, tackling topics as diverse as setting up a composting toilet to current asylum seeker policy. Running his own unconference session, Scrase shared lessons learnt so others can create their own social change festivals. While I did have to reluctantly return to those bright city lights, I learnt a lot about community and myself in three short days. Perhaps forgetting to pack a hammer was a good idea after all. 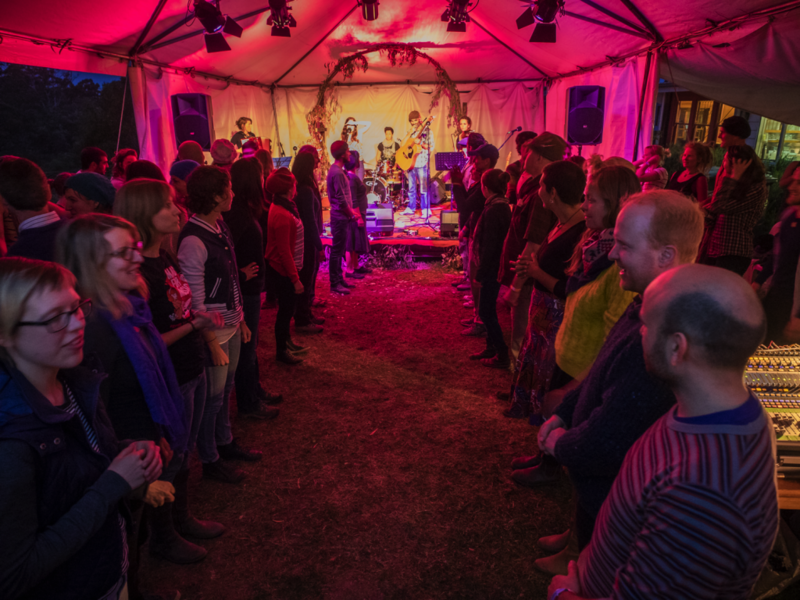 For information about future events at Commonground, join the 2015 mailing list. ← Papuan mountains key to Australia’s fresh water supply?